Alfred's Basic Piano Course Praise Hits, Book 2 arranged by Tom Gerou. For Piano. Book; Method/Instruction; Piano - Alfred's Basic Piano Course. Alfred's Basic Piano Library. Children; Contemporary Christian; Sacred. 24 pages. Published by Alfred Music (AP.40072).ISBN 0739092391. 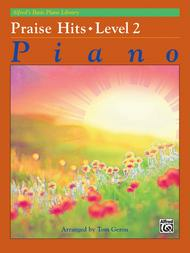 Children; Contemporary Christian; Sacred.Alfred's Basic Piano Library: Praise Hits fills the need for contemporary Christian music to be used as supplementary pieces for students. Soon after beginning piano study, students can play attractive versions of the best-known worship music of today. This book is correlated page-by-page with Level 2 of Alfred's Basic Piano Library: Lesson Book 2. When pieces from the Praise Hits book are assigned in conjunction with the material in the Lesson Book, new concepts are reinforced in a fun and motivating way, increasing the student's interest in piano study. Titles: Blessed Be Your Name * Forever * Forever Reign * Here I Am to Worship (Light of the World) * Holy Is the Lord * Hosanna (Praise Is Rising) * Lord, I Lift Your Name on High * Our God * Revelation Song * The Wonderful Cross * You Are My King (Amazing Love).